It is a well known fact that different trumpets (cornets, trombones, etc) "feel" different. The difference is in the bore of the instrument. But how does that work? What causes a different bore to make the instrument "feel" different? What follows is my own theory of the mechanics of the "bore". Feel free to disagree or correct me (politely, please). What does a player mean when he or she says a bore "feels" "open", "free blowing", "tight" or "stuffy"? I think it is the amount of resistance the player needs to overcome (i.e. air pressure the player needs to apply to the instrument, how hard he/she must blow) in order to pass a certain volume of air through (into) the instrument, and the resulting volume of sound which results from this. In each graph the horizontal axis represents the amount of air pressure applied to the instrument by the player, the vertical axis represents the amount of back-pressure or resistance the player feels coming from the instrument. The resulting sound volume and the volume of air required are not in these graphs. These graphs probably represent extremes. The way I see things, the starting point of the graph (vertically) is determined by the bore size: large bore = low initial resistance, small bore = high(er) initial resistance. The slope of the graph is linked to the taper of the bore. An instrument with very little taper (cylindrical) will have a rising graph, an instrument with a high degree of taper (conical) will have a flat graph. Graph "A" shows a large bore, conical instrument: the resistance starts out low due to the large bore, and doesn't increase very much as the air pressure applied by the player increases due to the large taper of the bore. Such an instrument would feel extremely open or "free blowing". Graph "B" shows the same large bore instrument with a cylindrical bore. Because this instrument has little taper resistance increases rapidly as player air pressure increases. Such an instrument would start out feeling "open" but soon feel "tight" as the player increases the air pressure. Graph "C" shows a small bore, conical instrument; initial resistance is higher than it is on the large bore instrument, but doesn't increase very much because of the large taper. An instrument with these qualities would feel quite free blowing in spite of having a small bore. Finally graph "D" shows a small bore, cylindrical instrument: high initial resistance that increases further with more air pressure. Of course it might well be that these graphs in fact could be curves with resistance being similar to graph A or C at first and as player air pressure is increased suddenly rising considerably, more like graph B or D. That would be similar to "hitting a wall". The less resistance there is, the easier it is to blow a larger volume of air into the instrument. The graphs above don't give the volume of air required for each bore "strategy". However, this can be inferred from the above graphs. For example, graph A requires quite a bit of air at low sound volumes and since there is little resistance the volume of air required goes up rapidly. 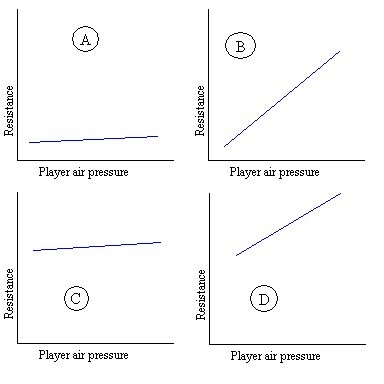 If in the above graphs you substiture "Volume of air required" for "Resistance" and "Volume of sound" for "Player air pressure", the graphs are crossed diagonally. In other words, the resistance and air pressure of graph A would correspond to the volume of air and sound of graph D and vice versa. Likewise, graphs B and C correspond to each other. Given for the moment that bell size is equal, to produce a specific low sound volume a small bore instrument should require less volume of air than a large bore instrument, but the player will need to overcome more resistance than on a large bore instrument. As the desired volume level increases, an instrument which is more conical will have less resistance to overcome, requiring less increase in air pressure in addition to the increase in volume of air than an instrument which is more cylindrical. The size of the bell is another variable in this equation. It serves as an amplifier: the larger the bell, the more volume will be produced for the same amount of effort. Might it be possible to name some instruments to go with the graphs above? My attempt at that would be something along the following lines, and please do correct me if I am wrong or if you have a better example to illustrate things. Graph A, large bore, high taper: Flip Oakes' Wild Thing. Graph B, large bore, low taper: Holton, from what I am told. Graph C, small bore, high taper: Conn 38B Connstellation. The 38B probably is the classic example of "graph C" (at least in terms of this website.... ). Graph D, small bore, low taper: Any suggestions? Naturally there is quite a bit of room between these extremes. Most #1 (0.433") bore Conn's would probably come in somewhere between "C" and "D". With the current trend towards large(r) bore instruments, I suspect most modern instruments are somewhere between graphs "A" and "B". A good example of the difference between a large bell and a small bell is the difference in feel between the Conn 36B Lightweight Connstellation and the Conn 38B Connstellation. The two instruments are essentially identical (at least for purposes of this article), except the 36B has a 4 5/8" bell while the 38B has a large 5 1/8" bell. Eventhough the internal bore and taper of the 36B and 38B are the same, the 36B will require more effort to produce the same volume of sound as the 38B since it has a smaller bell. Conn in its 1966 catalog describes the 38B as a "large bore feel" and the 36B as a "medium bore feel". And the size of the bell is the only difference. Different people of course prefer different instruments and different "feels". Some people like to blow "through" and instrument, others prefer to have something to blow "against". The "through" people will probably dislike small(er) bores and higer resistance instruments, in stead gravitating towards an instrument that behaves like graph "A", above. They might feel like they can't get rid of their air in an instrument with a smaller bore and more resistance. The "against" people on the other hand would probably dislike the "graph A" instrument on account that it swallows them up. They might feel like they are expending their air in an instant, there is "no resistance". These people might prefer something "open" and "free blowing" at lower sound levels (and air volume), but not like the large volume of air required in a large bore instrument with a lot of taper such as graph A. They might prefer something like graph B which is more "closed". Or, perhaps something like graph C, which generally requires less volume (more closed), but which doesn't have the large increase in resistance. To each his or her own.